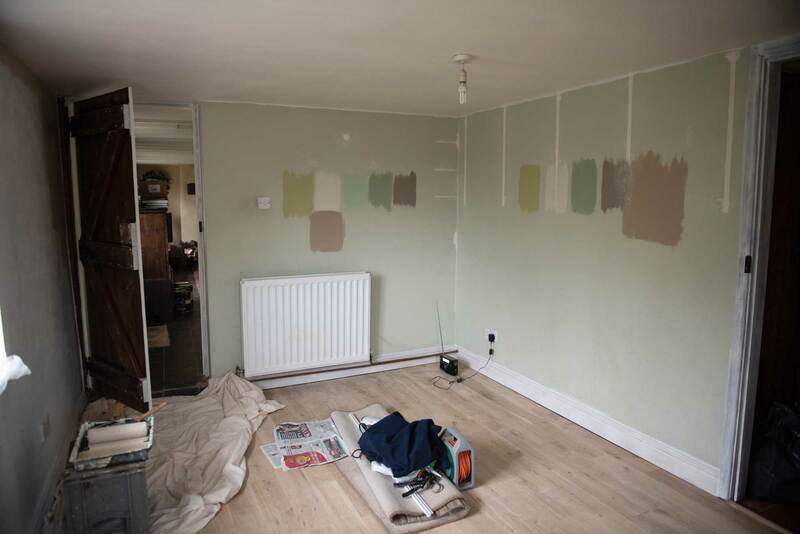 After almost 8 years since it’s last redecoration, our home office was in desperate need of some sprucing up when we finally got round to tackling it recently. 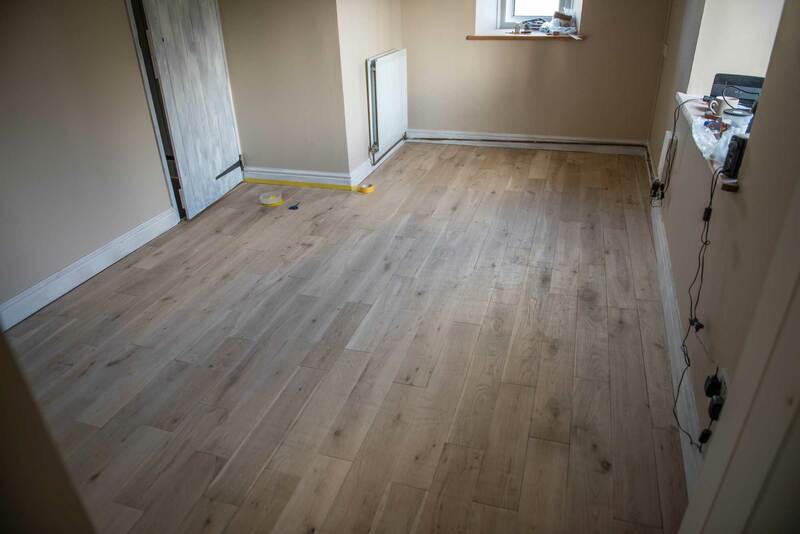 We’d installed a solid oak floor with a lacquered finish the last time we decorated, because we thought it would give it more protection from our Labrador puppy. As it turned out it did, but unfortunately the bomb proof nature of the lacquered coating came with a negative side effect - it was pretty slippery especially for excitable puppy paws. 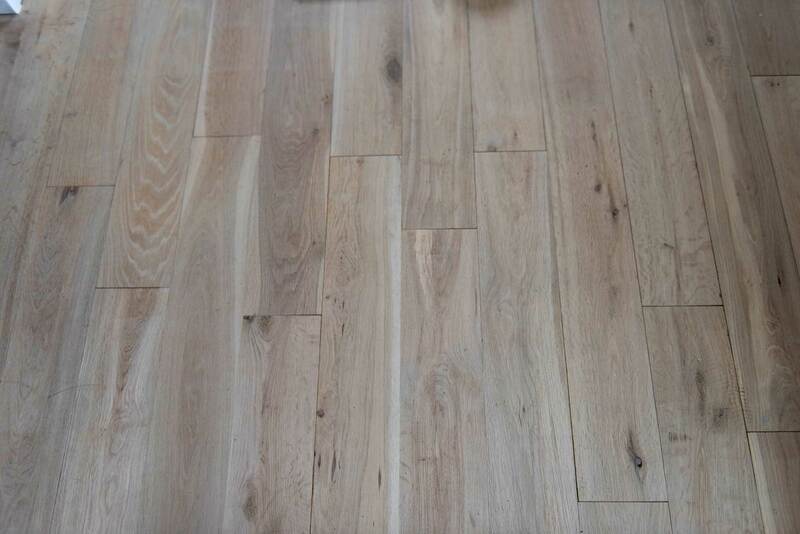 So when it came to redecorating this time, I was determined to give the floor a new look and feel and more importantly, no slippery finish for the dog. We started off by sanding the lacquer off the boards with belt and edge sanders which we hired locally. Working our way through the different grades of sandpaper, we started with a 24 grit paper and worked are way up to 100. Initial sanding of oak floor boards with 24 grit to remove their tough lacquer coating. Treatex recommend sanding to between 100-120 grit to allow their oils to penetrate fully into the wood and with the weight of the heavy sanding machines we were using, we gauged that 100 grit would probably give us something like a 110 finish anyway . Fully sanded boards down to 100 grit. 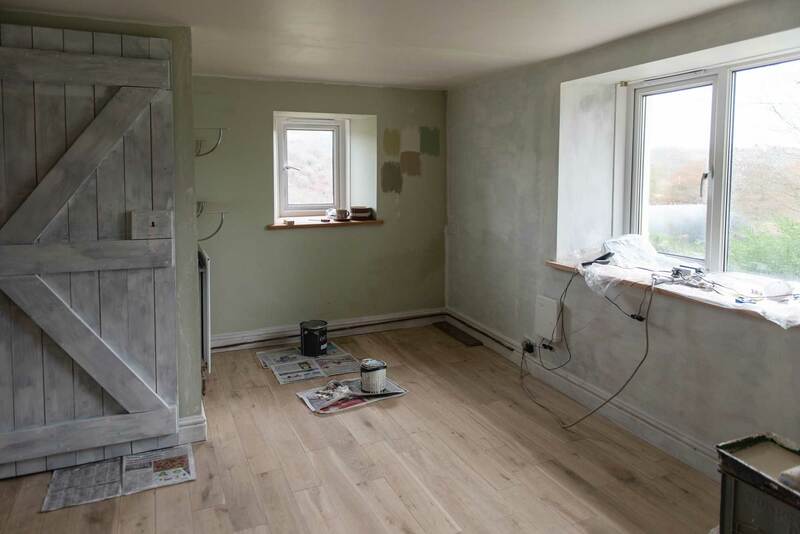 Once the floor was sanded I gave the walls a couple of coats of emulsion and sanded and undercoated the doors and skirting boards so that any drips or splashes that managed to get past our dust sheets could be lightly sanded off by hand. 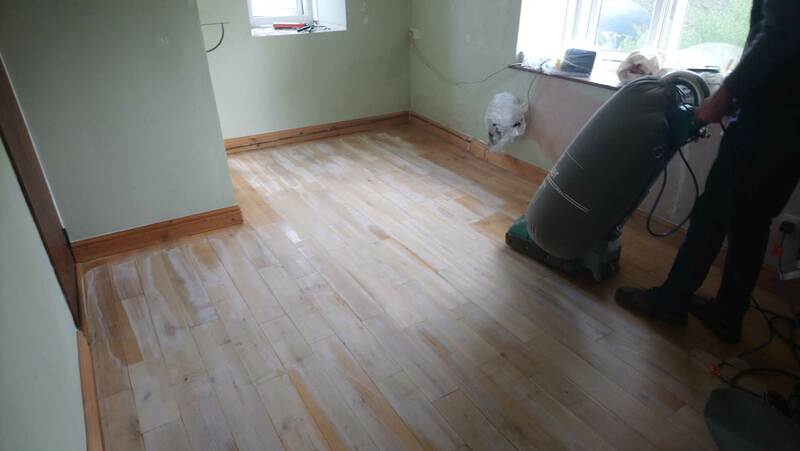 After that I masked off the skirting boards to prevent any overspill from the stain. 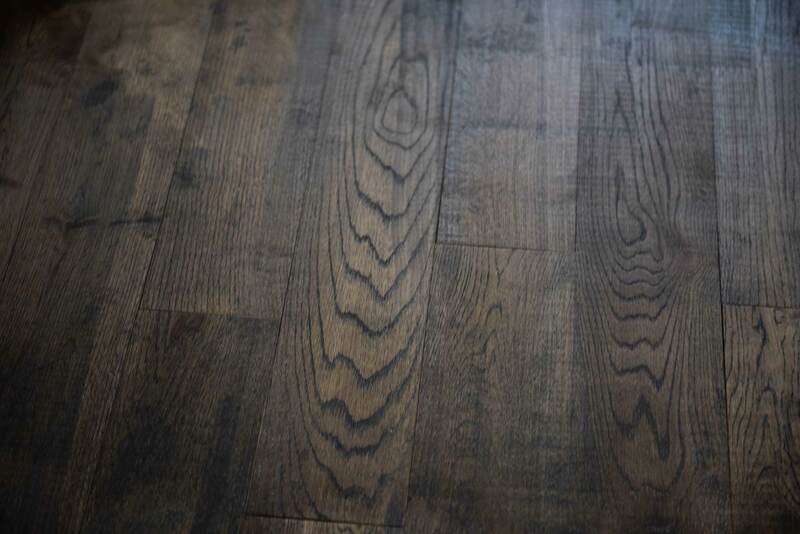 I’d decided to go for maximum impact with Treatex ’Ebony’ Colour Tones but to make sure I was happy with the colour, I tested it on a spare piece of wood we had left over from originally fitting the floor. It looked great! Applying the stain: I started working in a corner of the room which I knew wouldn’t be very visible when finished, to practice my application method. I’d been wrestling with whether to use a roller or a brush to apply the Colour Tones with and after initially starting with a roller, I found it put too much stain on for me, so I switched to a brush and it worked really well. I applied my Ebony Colour Tones in sections of about 2ft² and then rubbed off any excess stain with a lint free rag being careful to feather in the joins as I went along. This technique worked perfectly and I gradually worked my way around the whole room which took me a couple of hours. Next it was time to apply the first of 2 coats of Hardwax Oil Ultra to protect my lovely new floor. 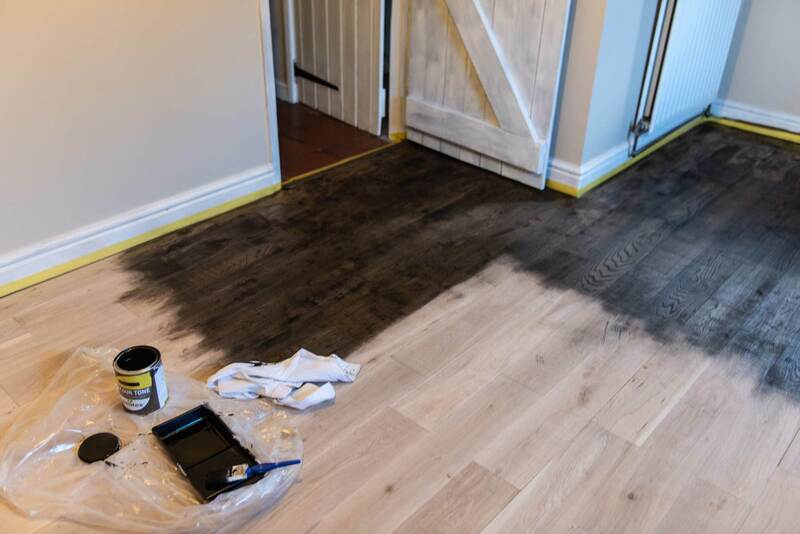 We’d plumped for the matt finish because we wanted to keep as much of a natural wood feel as possible and after working so well with the Colour Tone stain, I decided to stick with my brush. 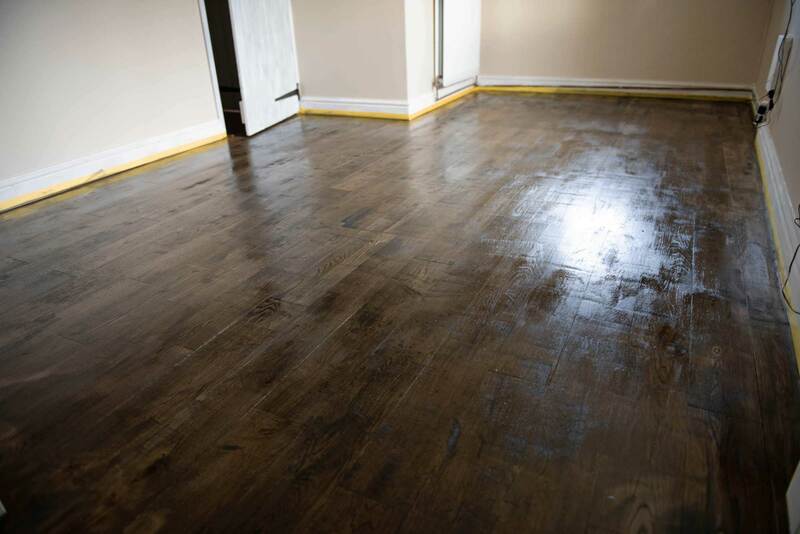 The Hardwax Oil Ultra went on like a dream and it took less than an hour to coat the whole room. After the first coat of Hardwax Oil Ultra – I liked the finish but felt it was a bit smoother than I wanted (keeping in mind I that wanted to make sure there was no chance of slipping for our dog), so for the final coat, I mixed in some Treatex Anti-slip Additive as well which went on just as well as the first coat but this time it not only gave me the matt finish I was after with more grip without feeling rough to touch either. Perfect! After my success with the floor, I decided to use the last little bit of my Ebony Colour Tones on the beach work top we’d installed, followed by 2 coats of Treatex Hardwax Oil in Satin this time which has given me a really nice surface to work on. 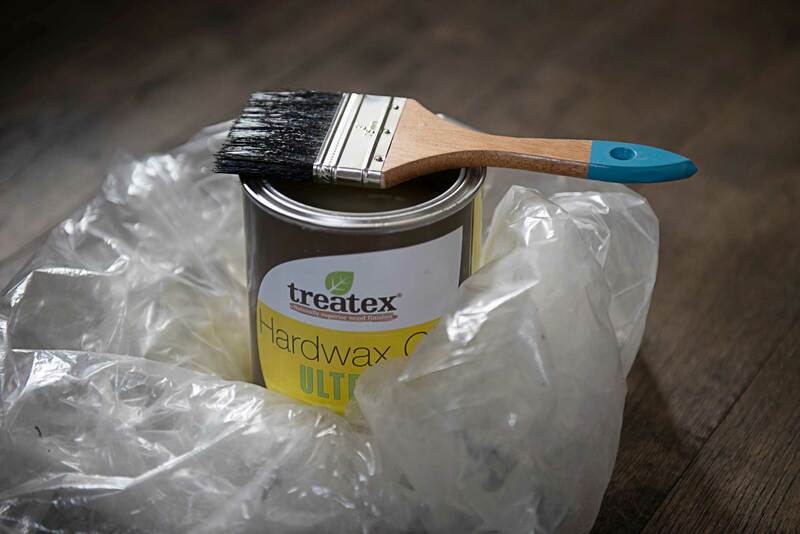 I’m really pleased with the results I got with all the Treatex products I used and would definitely recommend them to anyone looking to enhance and protect any natural wood finishes in their home.